Euglenozoa are a large group of flagellate protozoans, that sometimes infect human beings. Microorganisms (from the Greek: μικρός, mikrós, "small" and ὀργανισμός, organismós, "organism") or Microbes are tiny organisms—too tiny to see without a microscope, yet they are abundant on Earth. They live everywhere—in air, soil, rock, and water. Some live happily in searing heat, while others thrive in freezing cold. Some microbes need oxygen to live, but others do not. These microscopic organisms are found in plants and animals as well as in the human body. Some microbes cause disease in humans, plants, and animals. Others are essential for a healthy life, and we could not exist without them. Indeed, the relationship between microbes and humans is delicate and complex. There are four main kinds of microbes: bacteria, viruses, fungi, and protists. Bacteria are prokaryotes, whereas fungi and protists are both eukaryotes. Viruses are not cells, but instead consist only of one molecule of DNA or RNA. Bacteria are single-cell microbial organisms belonging to the prokaryote domain. Unlike other organisms, prokaryotes are characterized by the absence of a cell nucleus and other membrane-bound organelles. Although bacteria are known to be responsible for many infectious diseases, they also serve many beneficial functions such as the decomposition of organic matter and have formed a number of complex symbiotic relationships with other organisms. A virus is an acellular microbe, which cause disease by invading cells. They are among the smallest microbes, much smaller even than bacteria. Viruses are not cells. They consist of one or more molecules of DNA or RNA surrounded by a protein coat. Viruses can be rod-shaped, sphere-shaped, or multi-sided. Some look like tadpoles. Viruses are not classified as cells and therefore are neither unicellular nor multicellular organisms. Most people do not even classify viruses as "living" because they lack a metabolic system and are dependent on the host cells that they infect to reproduce. Viruses have genomes that consist of either DNA or RNA, and there are examples of viruses that are either double-stranded or single-stranded. Importantly, their genomes code not only for the proteins needed to package its genetic material but for those proteins needed by the virus to reproduce during its infective cycle. Containing over 100,000 species, Fungi are classified according to their method and structures associated with reproduction. Once mistaken as plants, fungi were proven to be completely different and placed in a separate kingdom. One distinguishing characteristic of fungi is the presence of chitin (a complex carbohydrate) in the cell walls. Fungi also do not perform photosynthesis, but rather are heterotrophs, depending on other sources for their food. These unique organisms are essential in almost every ecosystem because of their ability to decompose and recycle nutrients. Other fungi however, are harmful parasites that cause multiple diseases and infections. 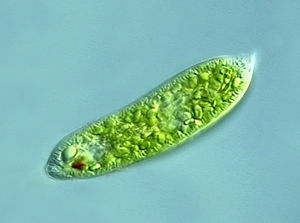 Protists are a taxonomic Kingdom (Protista) of eukaryotes, which include the ciliates, flagellates, amoeba, and algae. It is a very diverse group of organisms with both unicellular and multicellular forms, and are capable of everything from photosynthesis to predatory behavior. The protists are divided into three main groups based on their mode of nutritional acquisition: protozoan (animal-like), algae (plant-like), and slime mold (fungus-like). Microbiology is the branch of biology that studies the growth, structure, development, and other characteristics of microscopic organisms (those usually too small to be seen with the naked eye), including protozoans, algae, fungi, bacteria, yeast, and viruses. Most microbiologists specialize in a particular application of microbiology. For example, medical microbiologists study the relationship between organisms and disease or the effects of antibiotics on microorganisms. Other applications include environmental, food, agricultural, or industrial microbiology; virology (the study of viruses); immunology (the study of mechanisms that fight infections); or bioinformatics (the use of computers to handle or characterize biological information, usually at the molecular level). A common word for microbes that cause disease is “germs.” Some people refer to disease-causing microbes as “bugs.” “I’ve got the flu bug,” for example, is a phrase you may hear during the wintertime to describe an influenza virus infection. Since the 19th century, we have known microbes cause infectious diseases. Near the end of the 20th century, researchers began to learn that microbes also contribute to many chronic diseases and conditions. Mounting scientific evidence strongly links microbes to some forms of cancer, coronary artery disease, diabetes, multiple sclerosis, and chronic lung diseases. ↑ 6.0 6.1 Occupational Employment Statistics: Microbiologists by the U.S. Bureau of Labor Statistics. This page was last modified on 27 July 2014, at 17:09.